The names of all the monsters you can hunt in Monster Hunter World, and where to find them. Monster Hunter World is here and it's brought with it all sorts of monsters and beasts for the intrepid players to hunt, slay, or perhaps capture. Though you can't fight all the monsters at the beginning of the game, they will make themselves known as you progress through the story. But for those who want to see what lies ahead, we've got all monsters in Monster Hunter World listed. 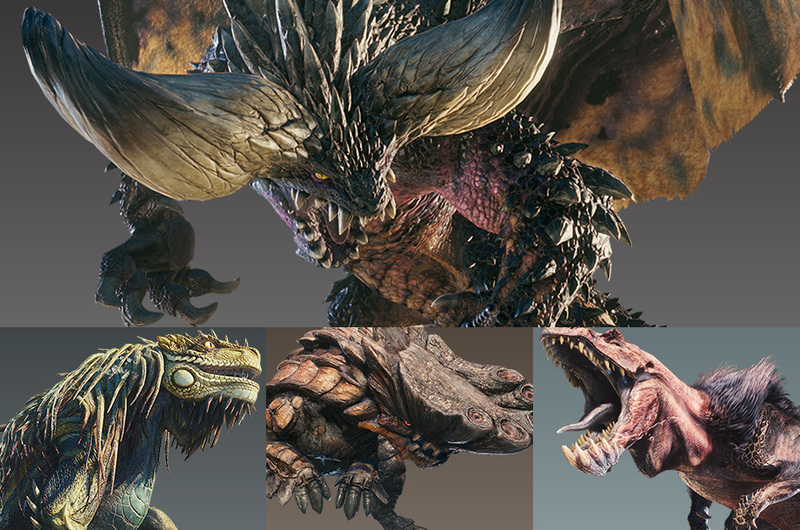 There are dozens of monster in Monster Hunter World, and they're split into several different groups. The large monsters are the major "bosses" in the game, and hunting them rewards you with new weapon and armor materials. Small monsters are there to populate the world, some of them are non-hostile while others will attack you on sight. Then there is the endemic life consisting of different bugs and little creatures that can be found scattered around the various areas. You can capture these and use them as decorations in your private room! As mentioned above, large monsters make up the main targets you’ll be hunting during your time in Monster Hunter World. These monsters have large health pools, various attack patterns, and most of them can be captured for greater rewards. Knowing the weaknesses of large monsters is important if you want to be effective when taking them down, especially if you’re struggling against some of the late-game beasts. There are a few unconfirmed large monsters, specifically: Lunastra, Ososhi Kirin, and Alatreon. The Great Jagras is one of the first monsters you’re going to encounter in Monster Hunter World. This lizard calls the Ancient Forest its home, and is a simple beast to hunt. The Kulu-Ya-Ku is found in Ancient Forest and Wildspire Waste, and uses a rock as a weapon to both attack and block. The Pukei-Pukei belongs to the Ancient Forest, and the Wildspire Waste as part of a one-time quest. Calling the Wildspire Waste home is the brute wyvern, the Barroth. This creature uses mud to change its defences and vulnerabilities, so be prepared to have your element attack type nullified. Another large monster in Monster Hunter World that called the Wildspire Waste home is the Jyuratodus, one of the only piscine wyvern in the game. A beautiful creature by all accounts, the Tobi-Kadachi is found in the upper branches of the Ancient Forest. Probably one of the first major hurdles in Monster Hunter World is when players are tasked with killing the Anjanath. This monsters is native to the Ancient Forest and is extremely ferocious. The Rathian can be found slinking around the Ancient Forest, especially up near its nest at the top of the tree. It’s also located in the Wildspire Waste, on the western side of the map. This frustrating bird wyvern is located in the Coral Highlands. The Tzitzi-Ya-Ku uses the fins on its head to blind everything in a cone in front of it. Taking on the appearance of a fluffy bat, the Paolumu is native to the Coral Highlands. The Great Girros slinks around the Rotten Vale, typically among a pack of smaller Girros. Be aware of its paralysis attack, as it will leave you incredibly vulnerable to attack. The rolley-poley Radobaan lives in the Rotten Vale and covers itself in bones and spikes to protect itself. Smash this makeshift armor to gain access to its weaker flesh. Another flying wyvern, this time the pretty Legiana. You’ll find this large monster flying around the Coral Highlands. It might be a good idea to bring the Glider Mantle with you, as making a quick trip to the top of the map is essential if you want to trap it. The Odogaron offers another spike in difficult, but thankfully it is extremely susceptible to paralysis attacks. You can find this toothy monsters in the Coral Highlands and in the Rotten Vale. Not to be confused with the Rathian, the Rathalos is also native to the Ancient Forest, but it takes on a red hue as opposed to green. Yet another difficulty spike comes with this monsters, with many players struggling to kill the Diablos the first time around. You’ll discover this hulking monstrosity stomping around the Wildspire Waste. The biggest monster in the game, the Zorah Magdaros. This Elder Dragon has no habitat and can only be farmed as part of the main story or when it appears every-so-often as an optional quest. It might look a bit cute, but the Dodogama is a powerful monster to face. You’ll find this lava-belching beast in the Elder’s Recess. A variation of the Rathian is the Pink Rathian, called that because of its pink color (surprise!). You can find the Pink Rathian in the Wildspire Waste as well as the Coral Highlands. The Bazelgeuse goes where it pleases and destroys whoever it wants. This giant flying wyvern is home to all five locations: Ancient Forest, Wildspire Waste, Coral Highlands, Rotten Vale, and Elder’s Recess. One of the few piscine wyverns in Monster Hunter World, the Lavasioth is found in the lower lava-filled area of the Elder’s Recess and is one of the monsters you must sight in the Elder’s Recess. Another rolley-poley monsters in Monster Hunter World is the Uragaan. This large monster is found in the Elder’s Recess and is easily tracked by looking for its pocked markings. The Azure Rathalos is, surprise, a blue-ish version of the formidable Rathalos that is found in the Elder’s Recess. If you haven’t yet faced this beastly monster, prepare for an epic fight. Killing the Nergigante is no small feat, it’s large, fast, and can very easily one-shot most hunters. You’ll find this thorny devil in the Elder’s Recess, enjoying being an apex monster. Because it is an Elder Dragon, it cannot be trapped, meaning every type of trap is useless against it. Small monsters in Monster Hunter World consist of the creatures you’ll find walking around the various areas. These monsters do not pose much of a challenge and or often found in groups. Endemic life refers to anything that isn’t a large or small monster. These little creatures are found all over the different areas, and each of them can be caught using the net tool in order to decorate your private room. There are quite a lot of monsters you’ll be tracking and capturing during your time with Monster Hunter World, and quite a few are sure to give you a rough time. When the DLC eventually releases, we’re likely to see some of the more speculative monsters join the roster. For now though, head over to our Monster Hunter World guide for more useful information on Capcom’s best-selling game.